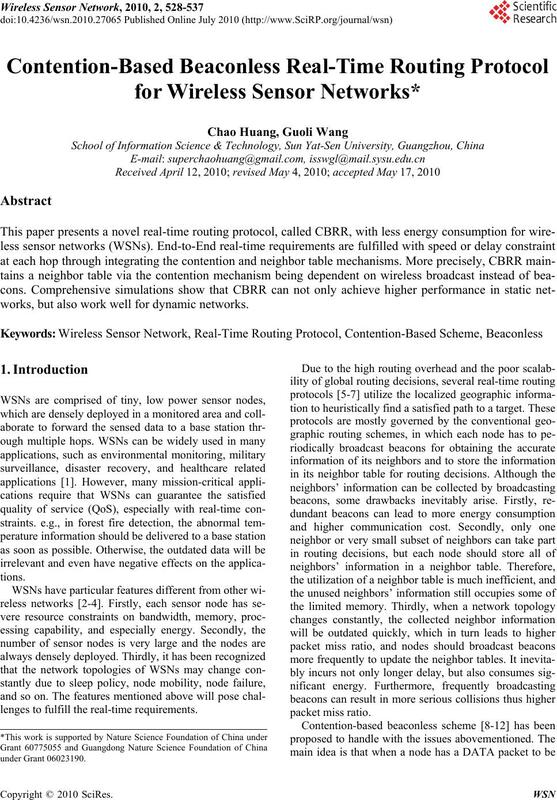 works, but also work well for dynamic networks. lenges to fulfill the real-time requirements. forwarder without any prior knowledge of its neighbors. Real-time Routing protocol for WSNs, called CBRR. meets the real-time requirements, in the neighbor table. data with a class-based queue model, simultaneously. suffered from the aforementioned drawbacks. quirements with less energy consumption for WSNs. Deadline DT, where Tnow is the current time. select a new next-hop forwarder. ID and an out-of-band busy tone. rent forwarder and the sink, and the required delay. Figure 1. Unicast forwarding procedure. and its contention candidates work as follows. just discards the DATA packet. candidate is forbidden to take part in the contention. should respond an ACK packet to the current forwarder. Figure 2. Current forwarder’s working procedure. Figure 3. Contention candidate’s contention procedure. and the number of packets waiting in the output queue. For node i, its contention priority is computed as follows. respectively, and meet α + β + γ + η = 1.
wait delay of Tshort and Tlong as follows. it can be guaranteed that Tshort is smaller than Tlong. ous one-hop delay as follows. 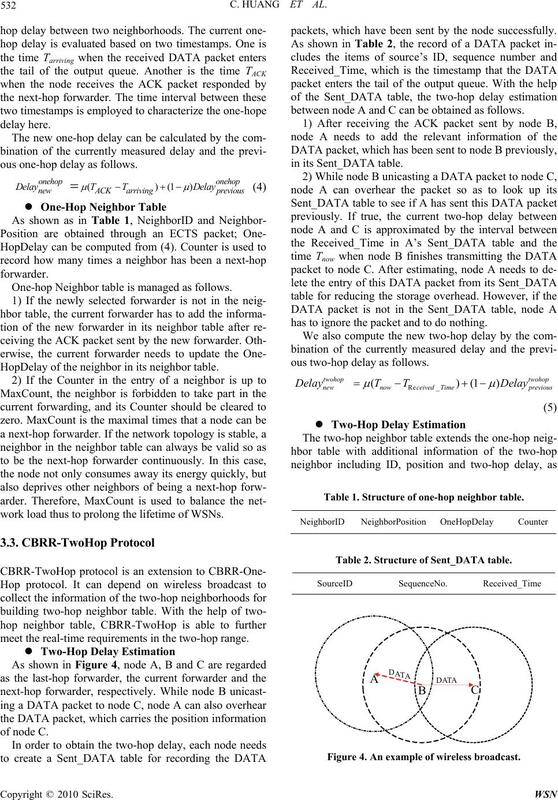 One-hop Neighbor table is managed as follows. 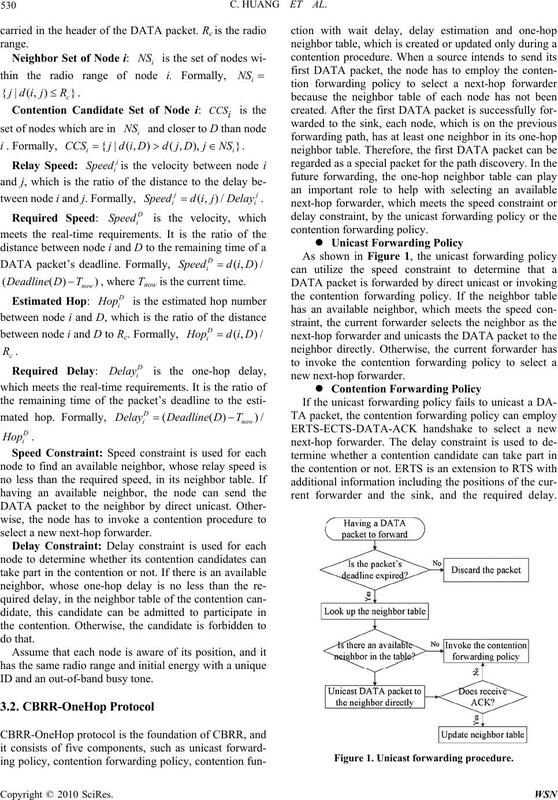 HopDelay of the neighbor in its neighbor table. work load thus to prolong the lifetime of WSNs. meet the real-time requirements in the two-hop range. packets, which have been sent by the node successfully. between node A and C can be obtained as follows. has to ignore the packet and to do nothing. ous two-hop delay as follows. Table 1. Structure of one-hop neighbor table. Table 2. Structure of Sent_DATA table. Figure 4. An example of wireless broadcast. the same as those in one-hop neighbor table. Table 3. Structure of two-hop neighbor table. Table 4. Parameters for experiments. able due to node mobility or sleep policy. rameters for experiments are set as shown in Table 4.
kets, such as RTS/ERTS, CTS/ECTS, ACK or beacon. Figure 5. Impact of packet generation rate. Figure 6. Impact of packet size. 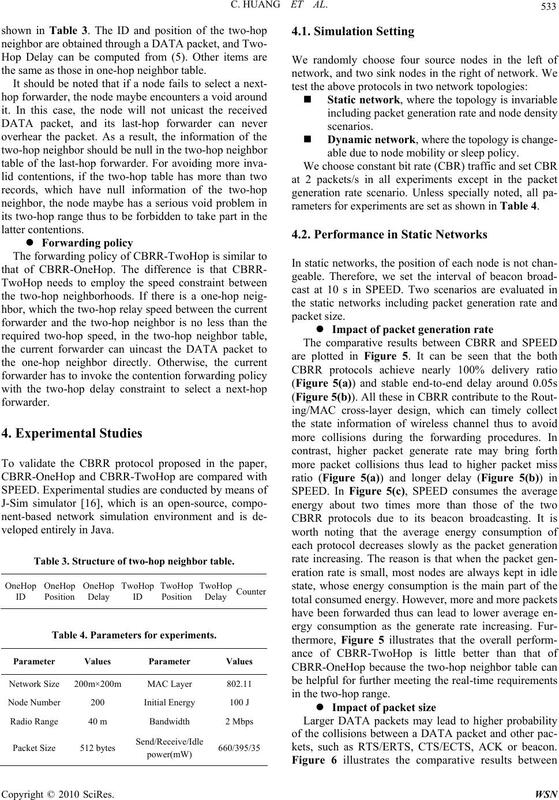 of the two CBRR protocols. much instable for its extremely high packet miss ratio. 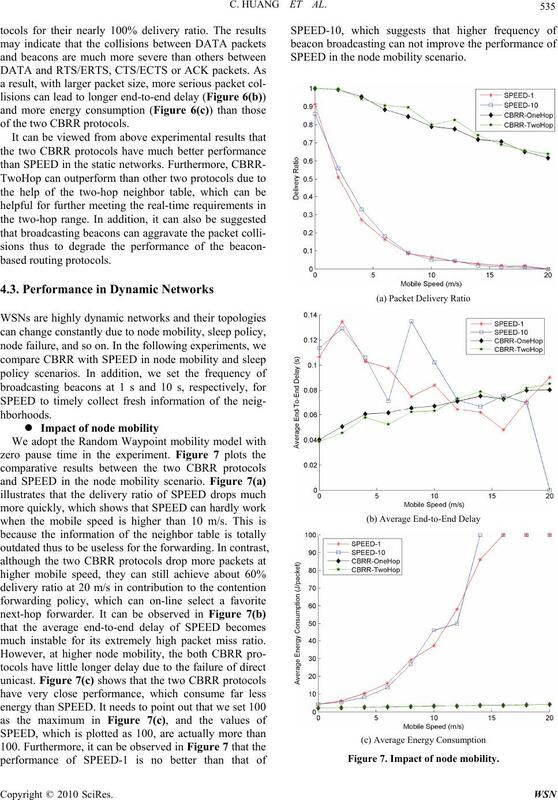 SPEED in the node mobility scenario. Figure 7. Impact of node mobility. cludes an active sub-period and a sleep sub-period. bility scenario as shown in Figure 8(b) and Figure 8(c). Figure 8. 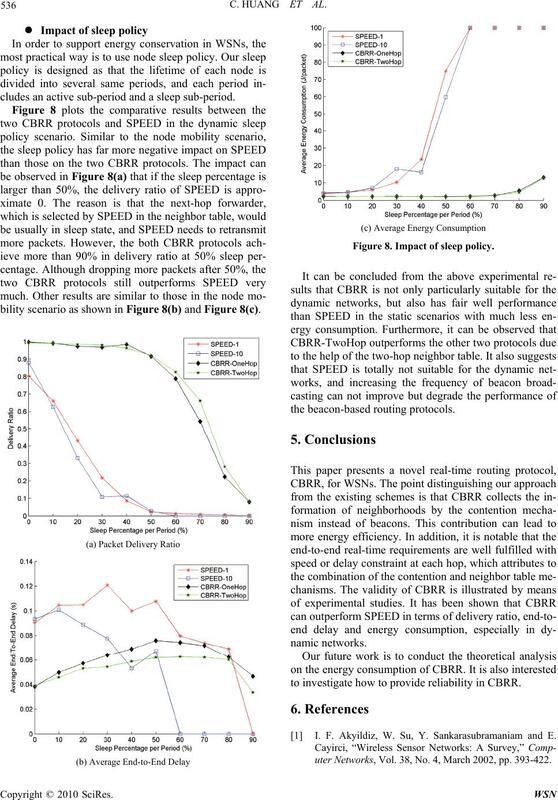 Impact of sleep policy. 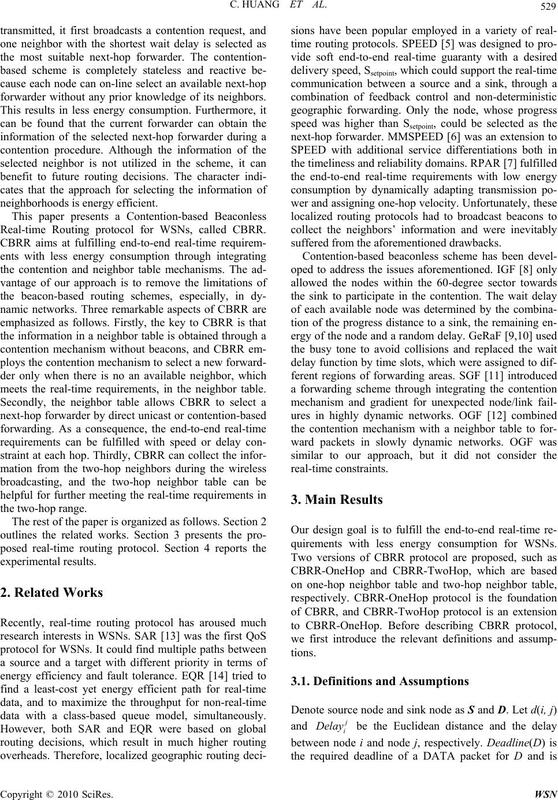 to investigate how to provide reliability in CBRR. 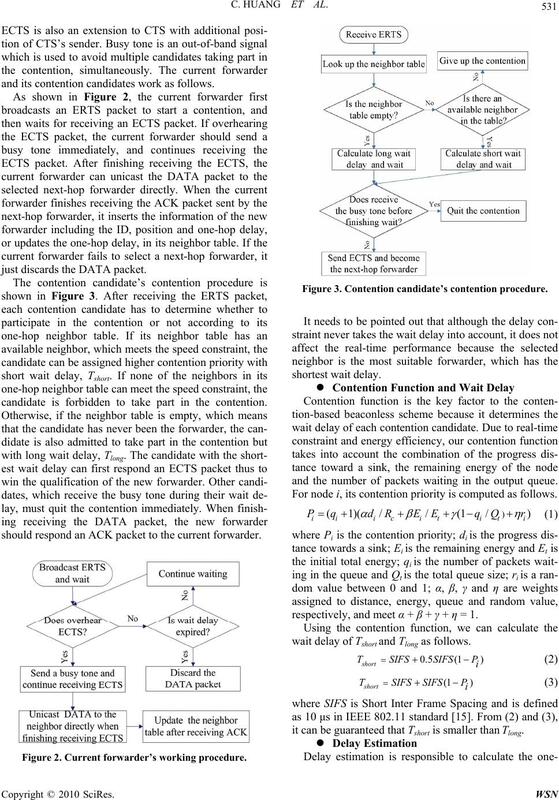 I. F. Akyildiz, W. Su, Y. Sankarasubramaniam and E.
uter Networks, Vol. 38, No. 4, March 2002, pp. 393-422. Sciences, Hawaii, January 2004, pp. 292-301. O. 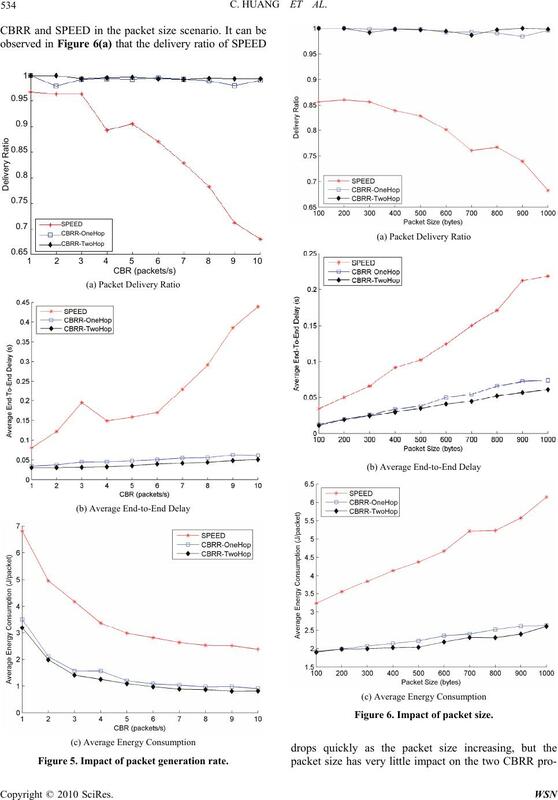 Z. Chipara, Z. M. He, G. L. Xing, Q. Chen and X. R.
Systems, Vol. 37, No. 3, December 2007, pp. 261-289. Computing, Vol. 2, No. 4, October-December 2003, pp. Vol. 2, No. 4, October-December 2003, pp. 337-348. Networks, Vol. 5, No. 2, March 2009, pp. 1-25. 15, October 2007, pp. 2954-2967. No. 2-3, July 2005, pp. 179-188. ISO/IEC 8802-11: 1999(E),” IEEE, August 1999.